Monday Morning Pet Peeve/New Track Posting! Today is two-for-one Monday!! 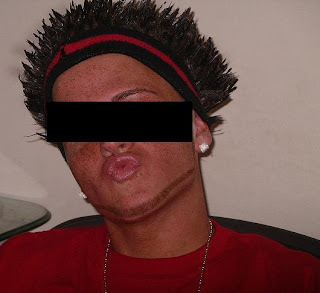 First the pet peeve; The Faux-Hawk and Guido Hair. The Faux-hawk was made popular by David Beckham back in 2003, and if you've noticed he doesn't wear it anymore, so why do I still see them EVERYWHERE!!!!! It was cool 5 years ago, and it took Japan by storm. I know the US is a little late on the uptake when it comes to trends overseas, but seriously, let it go! The Faux-hawk is almost as bad as the EMO/Flock of Seagulls doo we see ultra-artsy and creative types wearing. Best example is that jackass who won "Project Runway", Christian Siriano ( I can't stand him! ). But what is truly worse is the Guido/Gotti boy haircut! These are the jokers that are in the club with sunglasses on! Made popular by the TV show "Growing Up Gotti", this hairstyle requires gallons of Aquanet and DippityDoo. I believe there is a hierarchy that goes along with the height of the hair. Reminds me of the hightop fade of the late 80's early 90's. Whomever had the highest hair, had the most juice!!! So, in conclusion, if you see yourself wearing any of these hairstyles, consider this your cease and desist order!! If you are a witness to any of these infractions, it is completely within your rights to slap someone! Second post: I was scouring the interweb and came across a new Estelle song! We know I love Estelle! This UK song bird has managed to cover one of my favorite artists, Stevie Wonder. I'm not sure when or on what album it will appear on, but check it out.